I had long heard of Greenfield Village, but what I had heard hardly prepared me for the reality. It had been portrayed as a farm once owned by Henry Ford where Ford had installed buildings associated with his friends Thomas Edison and Harvey Firestone. While that is in fact true, it falls very short of telling the whole story. 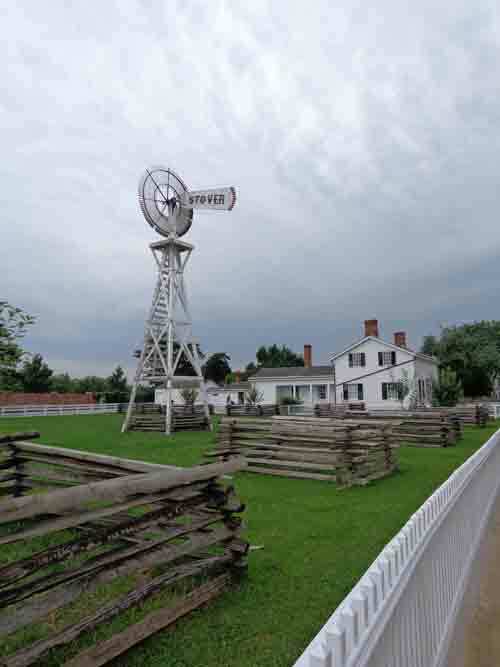 Henry Ford’s childhood was spent on this farm. Greenfield Village is a sprawling collection of historic buildings, farms, trains, Model Ts, and horse-drawn wagons from across the U.S. and Europe, which offers an introduction to the way people used to live and, in some cases, the lives of some very important people in U.S. history. For the word lover in me, there was Noah Webster’s House, Robert Frost’s house, and the home and first school built by William McGuffy, of McGuffy’s Readers fame. Almost every building is the original, purchased and moved to the site by Ford — the few exceptions/recreations clearly noted as such. 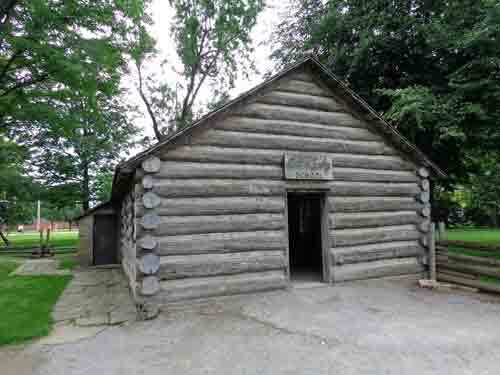 For the food historian in me, Luther Burbank’s birthplace and a recreation of George Washington Carver’s slave cabin (created from a description by Carver himself) gladdened my heart, as did the several farms and the Eagle Tavern, where one can dine on dishes from the 1800s. But I was delighted by everything. A chalet from Switzerland, a cottage from the Cotswold’s, an imposing jewelry emporium with massive clockworks from London represented Ford’s international interests. Demonstrating his love of invention were Edison’s Menlo Park complex, one of Edison’s first “Illuminating Companies,” the home and bicycle shop of the Wright Brothers, and a wide range of machines dating to the Industrial Revolution. And a lot more: print shop, gristmill, saw mills, plantation, windmill, and a long list of other historic homes. It really requires an entire day to explore even most of what this place has to offer, and probably a few visits to really take in everything (including the re-enactments of everything from cooking and plowing to short plays that bring to life events in the lives of those whose work or homes are there to craft workers creating once-common goods from glass, iron, tin, and wool). Then, if you have another day available, you can go next door to the Henry Ford Museum, often just called The Ford. The building covers 12 acres and has a collection that covers pretty much everything that happened from about 1850 to 1990. But that’s going to be another trip. This time, Greenfield Village was my focus — and though I stayed till it closed, I left already planning to return.